Is your blog suffering from late and missing posts? Are you scrambling for topic ideas to fill your content pipeline? Get your editorial workflow back on track with these tips. Tip #1: Build out an Editorial Calendar. 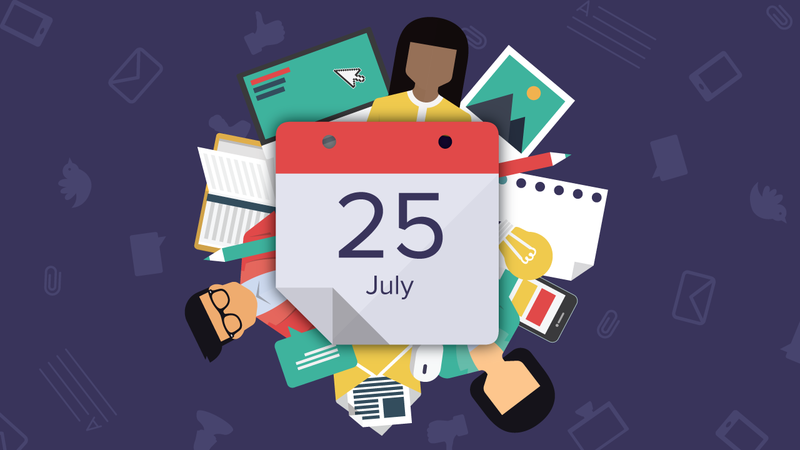 I know it can seem daunting to build out an editorial calendar, which is why some content teams assign topics as they go, creating new content in a just-in-time manner. While I think it is certainly beneficial to leave room in your editorial calendar for topical/newsy content, I find an editorial calendar to hands-down be the best tool I have for keeping my editorial content varied and on schedule. Why? Because it gives me the opportunity to see, at-a-glance, which topic categories I’ve recently published on and have upcoming, author workloads, and gaps I need to fill. My current quarter’s editorial schedule. I put down everything we have scheduled– including blog posts, e-books, SlideShares–you name it! the only thing I don’t include here is my social media content– I handle that in its own editorial calendar. The big list of categories and subcategories we’re writing about. Too often, your writers (and editor) can get into a rut, focusing in on the same primary topic, which can get boring for them– and for your readers. The category tab also makes a great visual aid starting point for brainstorm meetings. A tab for capturing ideas. Every time someone says “hey we should create some content on…” capture it in your ideas tab. Flesh it out with links to examples or your notes as more ideas come to you. Then share those notes with your content creator as part of their assignment, to ensure you’re on the same page. The prior quarter’s calendar tabs for the year. I create a new editorial calendar for each year, which then acts as an annual archive of the team’s activities. 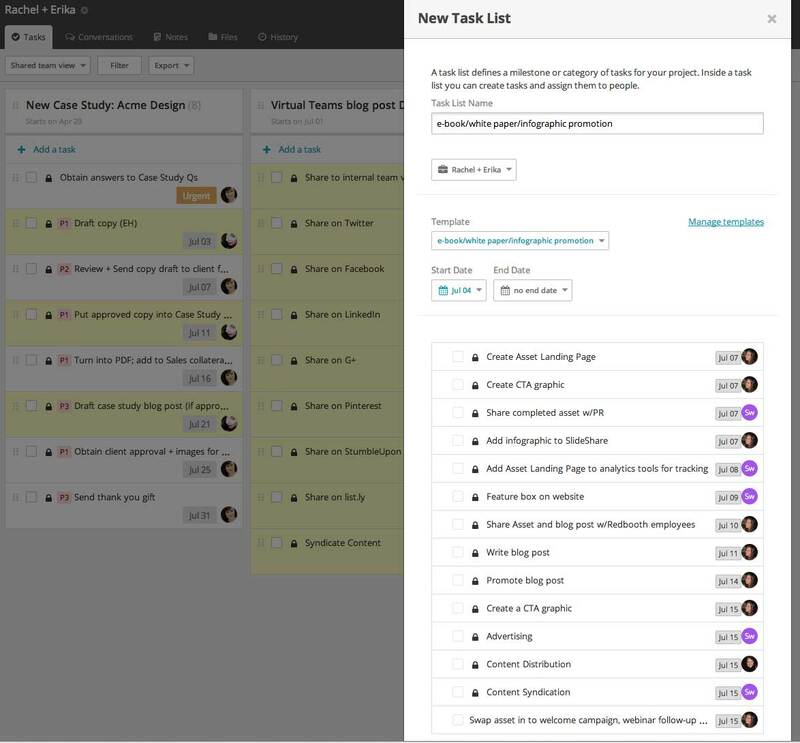 This is especially helpful when you’re looking to track team workflow volume and achievements year-over-year. Here’s a template of my standard starting point for my editorial calendars, in Google Spreadsheet form. Feel free to make a copy of it and try it out for your workflow. In addition to my Excel or Google Spreadsheet editorial calendar, I use Redbooth to visually monitor workflow, and ensure tasks are on schedule for delivering against the editorial calendar’s plan. You can color code different projects, and use hashtags such as priority in your tasks, to make your upcoming to do’s stand out. Tip #2: Create Templates to Standardize Frequently Completed Tasks. One of the ways I stay organized and ensure I get everything I need from my content creators is by providing templates to collect content submissions, and for defining the workflow. For example, if you’re publishing a blog post, there’s a lot more you need from the author than just the post copy. Rather than relying on the writer to remember what fields need to be entered into your CMS, and what your preferences are for the promotional social media content to promote the post, I include all of that information upfront in a template. Check out my blog post template as an example of how I document and standardize my blog content submissions. Don’t assume that your content creators understand how their missing a deadline will derail your editorial workflow– make sure they have visibility into your overall calendar, and understand your expectations around the task completion. Do you want a rough outline as your first draft? Or do you expect a first draft to be close to complete? Will they be involved in the design iterations? Or is the copy handoff their final to do? Make sure you’ve been clear in expressing your expectations, and in providing a detailed timeline for completion. I typically create a standard workflow documentation for each recurring content type, that includes how much time is allotted for each step in the content creation process, that I use on an ongoing basis with my team. This provides continuity for all the involved parties in the content process, and makes it less likely you end up empty-handed at the last minute. It also provides the level of detail you need to create a standardized task template in Redbooth. Check out my example timeline for an e-book on how to allot time and tasks for each step of the process. While this might feel like a lot of detail to be sharing, by sending this type of detailed workflow to your writer, designer, and marketing automation coordinator, you ensure that all three team members understand how their deadlines impact their colleagues’ work loads. One of the recurring reasons I’ve seen people turn in content late has been trying to track down a specific statistic, or being unsure on where, exactly, they can find the most up-to-date data to plug in. That leaves them playing email tag with someone elsewhere in the organization, while you stress over whether or not you’ll have the content ready for that big trade show you’re sponsoring. Luckily there’s a really easy fix: create an editorial team information repository. Creating and maintaining an information repository means no more hunting around last minute for the definitive source of record or attribution details. And that goes a long way towards making it easier for everyone to hit their deadlines. These are just a few of the editorial processes that keep my team’s workflows humming. Try Redbooth for free for one month, and implement my best practices on the collaboration platform.